One of my favorite places of all time is atop Gregory Bald. 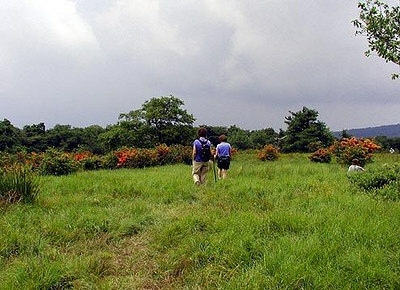 A wide open meadow with beautiful scenery and azaleas in June! Betty and Gretchen strolling ahead of me across the bald. I like this picture. We got rained on this day pretty heavily. Betty was in a hurry to get back because she had a date!